This conference is a high level thought leadership event where conversations and networking are meaningful and relevant. The inaugural Structure Security Conference brings together the world’s leading technology companies, CIOs, business leaders, CISOs and security industry companies for two days of high level thought leadership. About the Conference: The pace of innovation by technology companies is fueling the digital revolution and CIOs and business leaders are adopting digital capabilities at breakneck speed to transform their companies. No industry has been left untouched. But, the benefits of the emerging digital world come with increased risks from all manner of adversaries as attack surfaces grow exponentially with the sophistication of the attackers. CISOs are struggling to keep up with the threats as the security industry itself responds with an increasing array of products and services. Structure Security Conference is the first and only conference to bring all of these constituencies together to discuss the best path forward. Everyone with a vested interest in information security — CISOs, CIOs, tech companies, security vendors, and investors — will come together to discuss these issues and learn from each other at Structure Security. Security in the Cloud: The migration of critical business functions and applications to the cloud has changed the way companies think about security risks and operations. Learn how leading organizations think about security as part of their cloud computing strategy. Think Like a Hacker: Learn how the success of your technology and cybersecurity strategies can be radically improved by understanding how attackers think and operate. Social Engineering: Hear how leading organizations work to mitigate the security risks caused by social engineering and human error. And learn how to prepare for the future as this challenge continues to evolve with the adoption of new technologies. Minimum Viable Product = Most Vulnerable Product: Even if Facebook itself has moved on from this ethos, its “move fast and break things” culture was the mantra for a new generation of technology startups. Hear how leading technology executives have successfully enabled their teams to remain as agile as startups without sacrificing the security of the applications they create. Securing the Government: How do government organizations secure their technology infrastructure? What role should the government play in helping the private sector secure our technology infrastructure? Internet of (vulnerable) Things: The rapid adoption of IoT for both industrial and consumer applications has created a massive new attack surface and significant risks for IoT adopters. How do IoT vendors and companies embracing IoT deal with the security challenges created by this explosion of connected devices? Evaluating Security Solutions: The days of spreading FUD (fear, uncertainty and doubt) to sell security products are quickly fading away. Leading CISOs have a strong vision for how their teams should evaluate their existing vendors and new solutions. Hear some of these leaders share their vision and approach, and hear from security vendors who are leading the way helping these CISOs and their organizations succeed. 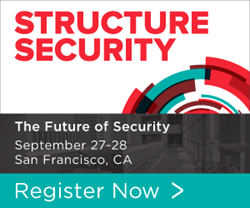 Attend Structure Security this September 27th and 28th at the Golden Gate Club in San Francisco’s gorgeous Presidio district. As with other Structure Events, the conference is expected to sell out. Register today to ensure your spot.